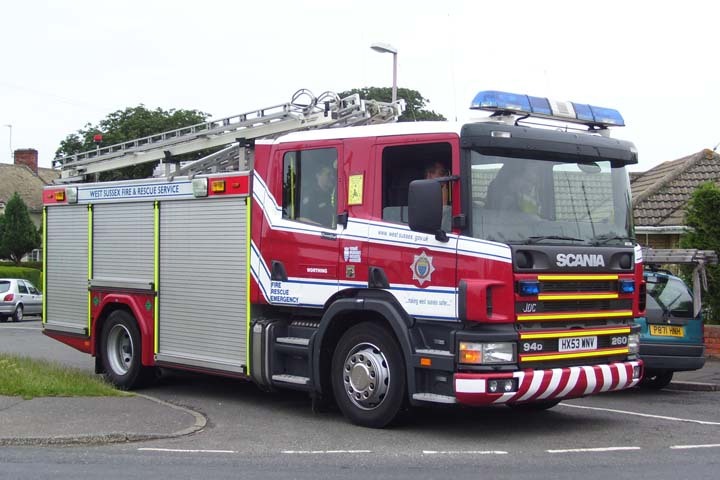 2003 Scania 94D/260 JDC Water Tender Ladder of the West Sussex Fire & Rescue Service.This appliance is based at the station in Worthing which is Wholetime/Retained with three pumps and one of the busiest stations in brigade. The order by West Sussex of the new Scania's have started taking place with 4 having been delivered. as third pump(spare for Keymer)for the retained. The brigade needed to buy the 2 so they could fit into Keymer fire station,both will be used but Crawley's will always be available if the need should arise then it can be transferred at short notice to Keymer if and when required. Added by Pete Matten on 22 April 2009.